The Ludwig Legacy Classic Series Drums mark the exciting return of an American classic. Developed to create a new range of drums that incorporate the features and benefits of today’s most advanced drum making processes, the Ludwig Legacy Classic recreates the classic sound of the world’s most famous drums. Combining the benefits of today’s most advanced drum making processes, with the know-how that comes with making drums for nearly a century, Ludwig’s Legacy Classic Series drums revive the distinctive sound of the world’s most famous drums. These custom-built, American-made percussion instruments are based on a modern re-think of the legendary, reinforced 3-ply Ludwig drum shells that set the standard for popular music throughout the 20th Century. Incorporating the many of the same methods used through-out its long and illustrious history, Ludwig’s exclusive Legacy Classic shells are made in-house from the choicest cuts of hand-selected North American hardwoods. At its core is a single 1/8” ply of premium Poplar for unyielding warmth and resonance. Inner and outer plies of 1/16” premium-grade North American Maple are then cross-laminated to the core to reproduce that magical balance of power and clarity for the modern era. This proven design is then augmented with 1/4” single-ply Maple reinforcement hoops, and rounded, classic cut bearing edges for thundering lows and pronounced cut in any musical situation. The Ludwig Legacy Exotic Series Drums are a stunning update of a modern classic. Superior construction and tone set the Legacy Exotic series apart from ordinary drums, the Legacy Exotic is destined to be a professional classic. Available in a variety of exotic woods including African Black Limba, Brazilian Sumauma and Australian Lacewood. Ludwig combines these exotic woods with maple and poplar cores the Legacy series is known for. The Legacy bearing rounded edge is also used on the Legacy Exotic series. 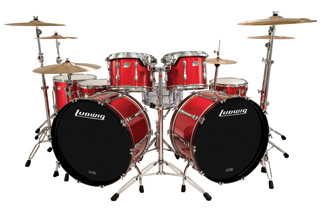 Please contact us for our best price on Ludwig Legacy Classic and Legacy Exotic drums.